Order 52 Weeks, 52 Marathons - The Miles and Trials of a Marathon Goddess today! Growing up in Santa Monica, California, Julie Weiss would do almost anything for love. Years later, overweight and depressed, she put one foot in front of another and found a new road beckoning. Running gave her the answers she was looking for. Julie's loving, larger-than-life father, her biggest critic during her wayward years, became her biggest fan as his now-fit and healthy daughter began to run marathons. When he died suddenly of pancreatic cancer, she decided to turn her new pursuit into a purpose and, in his memory, embarked on an incredible endeavor to raise money and hope in the fight against pancreatic cancer. It all adds up to make "The Miles and Trials of a Marathon Goddess" a riveting, humorous, poignant and ultimately uplifting book, for runners and non-runners alike! 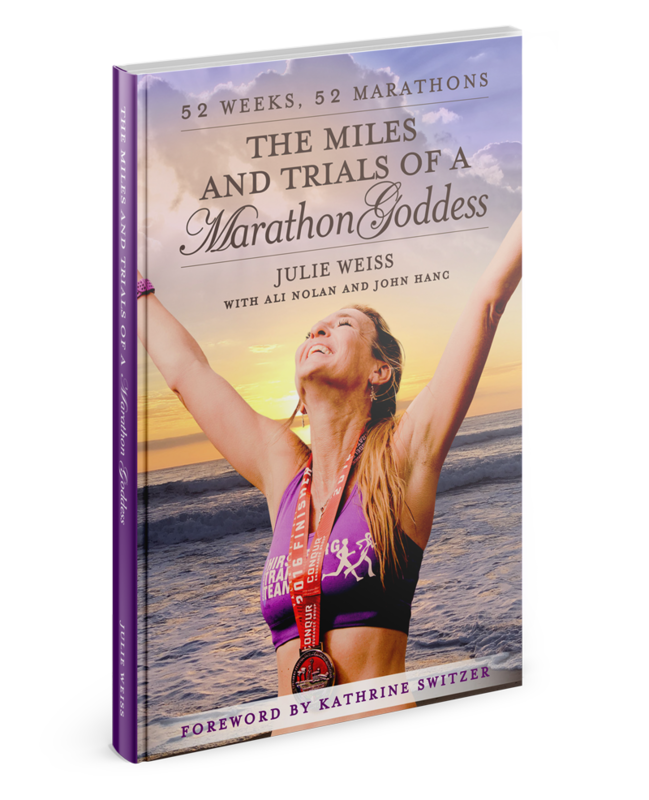 Julie's 52 Races for 52 Faces challenge will also go hand-in-hand with her book tour celebrating the release of 52 Weeks, 52 Marathons: The Miles and Trials of a Marathon Goddess, the story of how she turned her passion into a purpose.